PART I. The hundreds of DNA Case Studies performed at Irish Origenes have revealed some fascinating findings with regards the ancestry of the Irish male. Regardless of whether your background is Catholic Irish or Protestant Planter Scot or English, when you take a Y-DNA test (a DNA test that only explores the paternal line) there is a 65% chance that your Irish ancestor was of Gaelic (pre-Viking) origin. Those Gaels in turn were about 95% ‘Celtic’ (i.e. 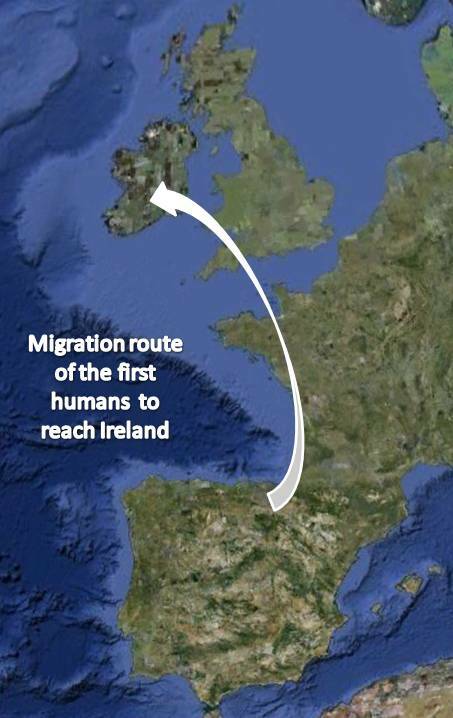 the descendants of the Celtic tribes that began arriving in Britain and Ireland from Central Europe in waves from about 800BC onwards) and 5% Prehistoric Irish inhabitants. 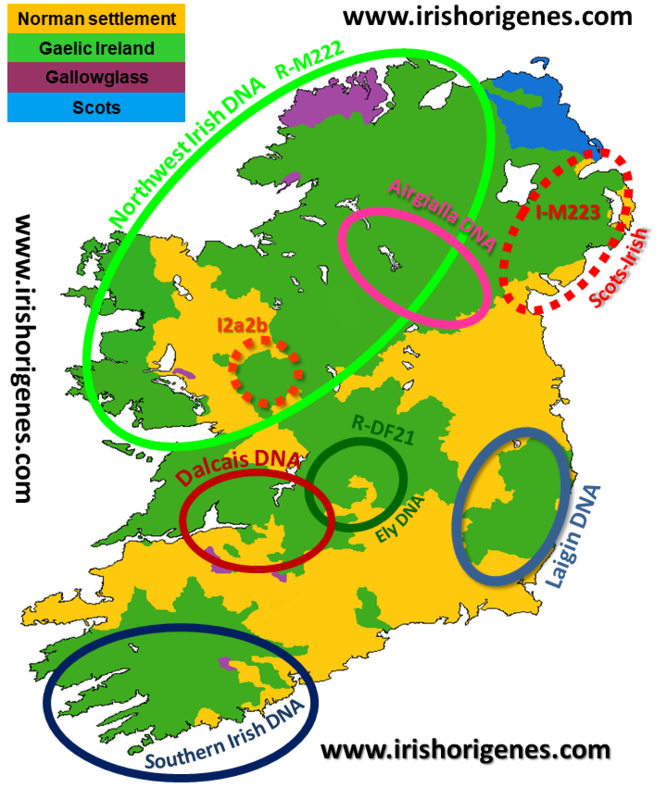 The Celt and Prehistoric Gaels have very different Y-DNA signatures revealed upon Y-DNA testing. 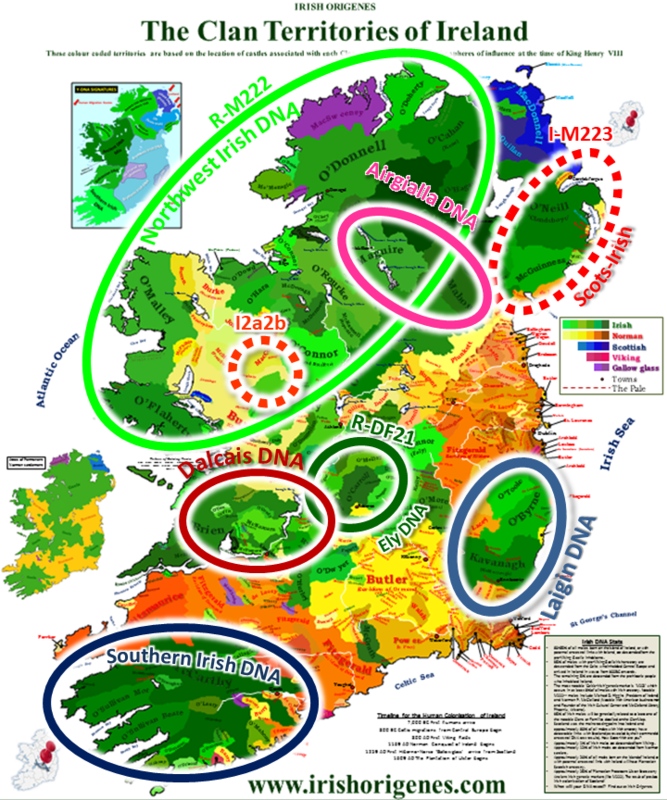 If you have Irish ancestry and your Y-DNA haplogroup comes back as I2a2b or I-M223 then your paternal line lines will lead back to one of two groups; one within the West of Ireland and another whose Y-DNA signature spans Southeast Ulster and neighbouring Southwest Scotland. The other ‘Celtic’ Gael tribal groups are all dominated by the R1b Haplogroup, but they too can be further broken down (where possible a terminal SNP/mutation is detailed on the accompanying map). 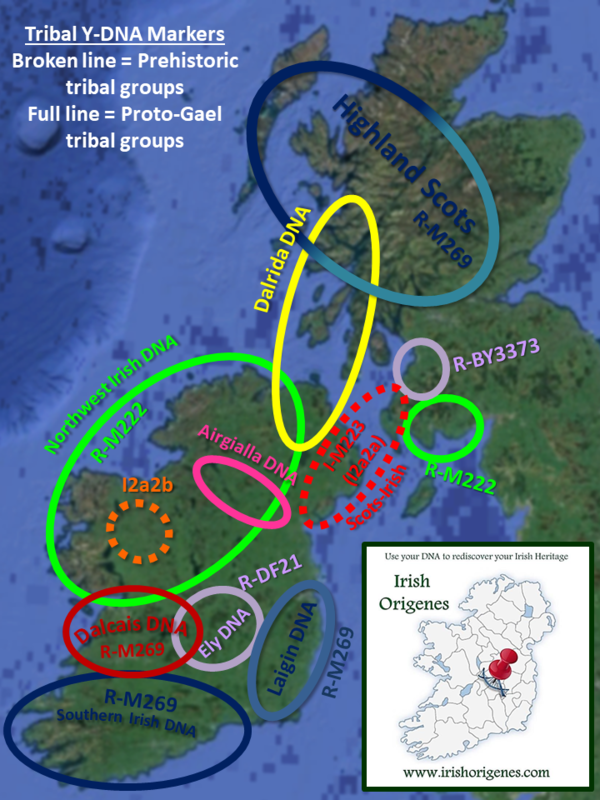 The variation between these groups is probably reflective of the different times at which they entered Ireland from Scotland, the oldest Celtic Gael tribal group is probably the M-222 Irish of the northwest, while the most recent arrivals are probably the Ely R-DF21 of the Irish Midlands. But why so little Prehistoric DNA? Did the Celts slaughter the inhabitants? Or did they succumb to new diseases brought by the Celts? Only time will tell (through sampling of ancient remains perhaps?). Since surnames arose approximately 1,000 years ago in what was an agrarian tribal society, it means that the surnames of your closest genetic matches revealed in the Y-DNA test are NOT RANDOM! 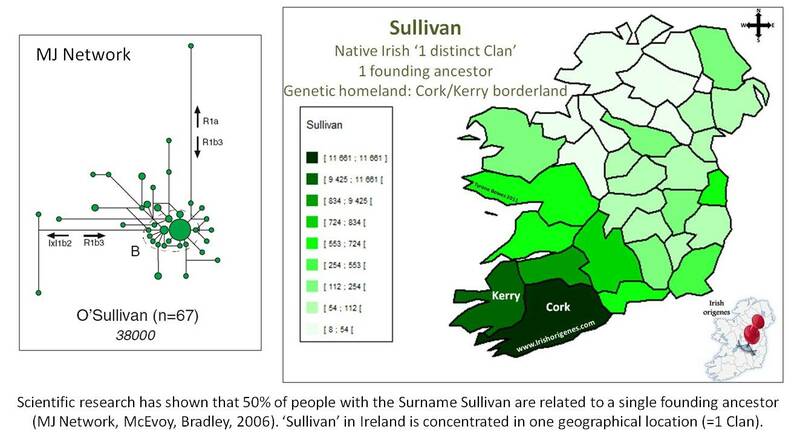 This means that each Gaelic ‘tribal’ group has its own fingerprint of genetically matching surnames revealed upon Y-DNA testing which in turn can identify a very specific location associated with your paternal ancestor (see attached table), even pinpointing where precisely your Irish ancestor lived (click here to read the most recent Irish Y-DNA Case Study). Each Gaelic tribal group is also dominated by a notable Gaelic Irish Clan (or Clans) which features prominently on the Irish Origenes Clan map (pictured above: the Clan map was reconstructed based on the location of castles in Ireland and their historically-associated Clan or Family). This dominance of a particular Clan/Surname in one’s Y-DNA results is most likely a result of fecundity among the Clan Chiefs (lots of wives and lots of male offspring). 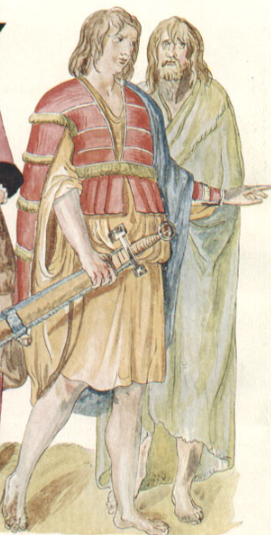 For example, the O’Dohertys who dominate M-222 Y-DNA matches account for roughly 1 in 10 males in Inishowen; which was the heart of their medieval territory. In another example, if you take a Y-DNA test and it comes back as I-M223, then you’ll typically match males with surnames like McGuinness, O’Neill, McNiece, McConville and McStay; surnames associated with South County Down in Southeast Ulster (heart of the McGuinness territory). In one final example, if you Y-DNA test and it reveals an M-269 marker with genetic matches dominated by the McCarthys, Sullivans, O’Donohoes, Donovan, O’Keeffes and O’Driscolls then your paternal ancestry lies somewhere within Southwest Ireland. Depending on who you match closest (among those recurring genetic surname matches) will determine where precisely your Irish origin will lie. Eerily, if one overlays the principal Gaelic markers on a map of permanent Norman settlement, it is in the areas that resisted Norman Conquest where the genetic legacy of the Gaels survives best. As a result it is more challenging to pin your Gaelic Irish ancestor if he remained in the Norman (yellow) areas of that map probably due to the influx of new settlers and displacement of some Gaelic Clans. However, even in areas where Norman settlement was most evident (Wexford, Kilkenny etc), Norman surnames only account for at most 30% of the population. Finally, almost every Irish male or male with paternal Irish ancestry will have detectable links as revealed by the commercial ancestral Y-DNA test with our nearest neighbour Scotland. If you have taken a commercial ancestral Y-DNA test then look for evidence of your earlier Scottish origin in the surnames of your matches at the 25 and 12 marker levels (keep in mind that not all Scots surnames begin with Mc/Mac’). By examining the various Irish Y-DNA Case Studies and their distant genetic matches I have been able to identify each Irish Gael tribal groups nearest Scottish kin, not surprisingly it is the groups that dominate the west coast of Scotland. REMEMBER FOLKS; your DNA results are produced in a scientific lab by trained scientists (I spent almost 20 years working in such labs). Always check the scientific qualifications of a blogger or Genetic Genealogist before employing their services or taking their advice. An honorary scientific title does not mean they are qualified (certain Universities should know better!). If you want to read more about the Gaels and their deeper European origin CLICK HERE for PART II.